Since its inception in 1999, Salesforce.com has become a leading provider of Customer Relationships Management applications and services, most of which are delivered through cloud and are accompanied by a broad range of complementary services such as marketing automation, digital commerce or community management. It is becoming an undisputable fact that Salesforce is now ruling the roost and is rapidly taking over the CRM market globally. 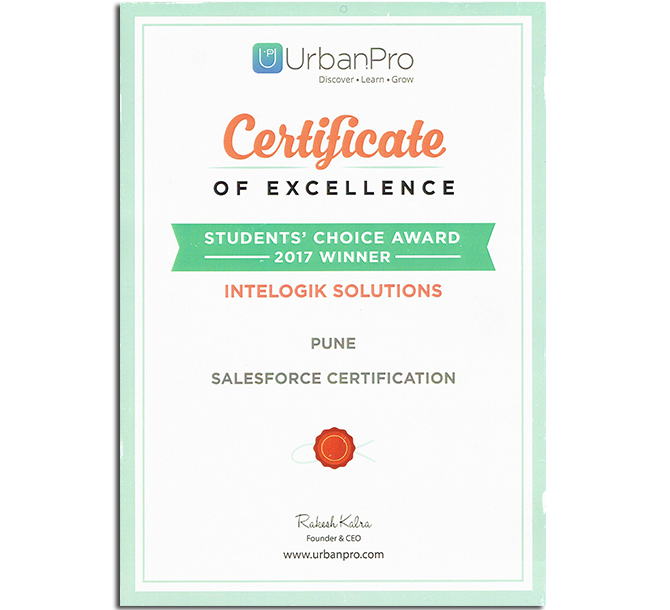 Salesforce has become as the world’s leading CRM software which has given outstanding results to the companies or organisations by making their business successful through tremendous customer satisfaction. Of late, a huge demand for Salesforce as a CRM software has cropped up in the American and Indian markets and as per the expert feedback, this demand is expected to soar high continuously for the next two decades atleast. Salesforce is coming out with many new features and enhancements to its platform each year, and has a strong vision, which is likely to support this growth. Salesforce facilitates fast and robust development of any business or customer service task. It provides an excellent interface to interact. One does not need to install anything like database server or application server as everything is setup on Cloud and can be accessed at anytime from anywhere. Professionals who take up courses in Salesforce training are able to build or develop applications in a couple of weeks. Partial interface, Login and Authentication, Security implementation is already done for the developer before he/she even starts to develop the software. Over the next four-five years, the Salesforce company plans to double its current revenue to $20 billion to $22 billion annually. It has been estimated that Salesforce company’s shares will most likely offer an investment opportunity with an above market rate of return. In recent years as well, Salesforce.com’s shares have outperformed the broader market. According to the company’s latest investor presentation and quarterly SEC filing, Salesforce’s revenue growth rate is approximately double the one of global CRM market and exposure to a single client has not exceeded five percent of total revenue. 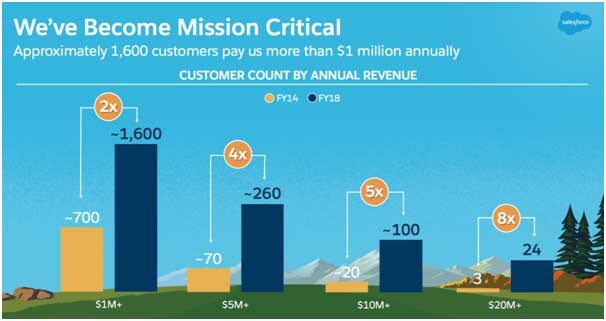 Following is the pictographic representation that depicts how Salesforce has recently expanded its highest-paying customer band significantly from three $20M+ customers in 2014 to twenty-four $20M+ customers in 2018. Due to the increasing demand of Salesforce as a CRM platform, it has been seen that a lot of companies and organisations from other CRM platform are rapidly migrating to Salesforce. Salesforce helps increase customer loyalty and better customer experience. In 2017, the arrival of the first 100% Lightning release from Salesforce, Winter 18, reinforced Salesforce’s goal to deliver what companies need for a world class customer satisfaction – a transition from Salesforce Classic to LEX (Lightning Experience). It is expected that in 2018, Salesforce will add more features in Lightning Automation tools like Process Builders, FLOWS and Analytics. And with Salesforce Einstein being the new talk of the town, and with more features expected such as face recognition, etc., it is believed that Salesforce is also all set to create history in CRM driven by Artificial Intelligence.